SIG SAUER is a world renowned weapons manufacturer and the choice for many of the tier one military, law enforcement and commercial users around the globe. SIG SAUER firearms and accessories are called upon to perform day in day out without fail, for countless agencies and personnel dependent on their unmatched precision and reliability. 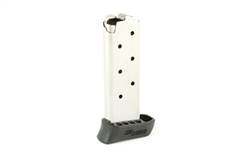 This SIG Sauer P238 .380 ACP 7 Round Magazine is an extended round magazine with finger rest standard factory replacement magazine . It is manufactured to SIG's strict specifications to ensure perfect fit and function. Insist on genuine SIG magazines for your SIG pistol.